We originally weren’t sure about this restaurant since it’s not character dining for dinner but it soon exceeded our expectations on all fronts. With excellent service and a cheerful staff that’s also receptive to our child’s allergy needs, we felt at ease right away. We entered when the events for the children began, where they got to sweep coconuts across the restaurant’s floor with brooms and dance to island music. Soon after, the polynesian food came out. We received huge helpings of side dishes first, which ties us over between skewers of meat brought around by our server. Please note, this is a restaurant for meat lovers (my daughter included). Vegetables are definitely lacking here. 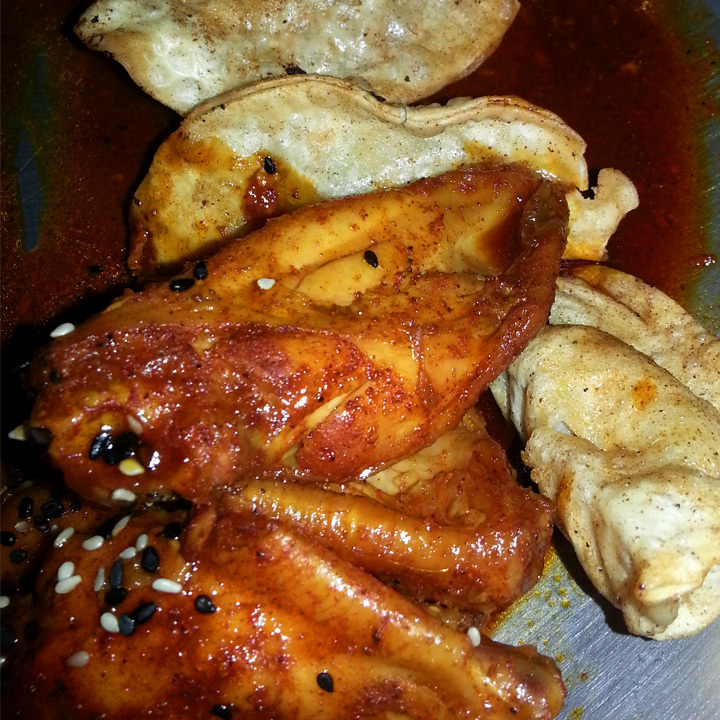 The side dishes of pan-fried dumplings and chicken wings are both dairy and peanut free and very tasty! Kay feasted on this meal alone and really didn’t need to eat anything else. She also had some skewered chicken and pork but preferred the crispiness of the dumplings to all other foods. For dessert hers came out first, which made her feel really special. It’s also her first ice cream sandwich! 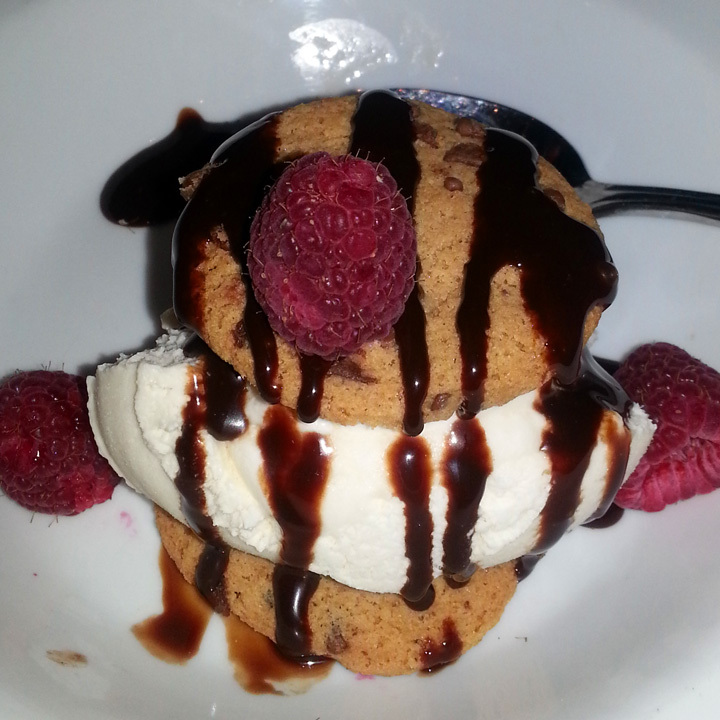 This dairy-free, peanut-free and gluten-free dessert is made with Rice Dream vanilla ice cream and Enjoy Life chocolate chip cookies. It’s as good as it looks, so she gobbled it up really quickly. It’s definitely a memorable night for us. 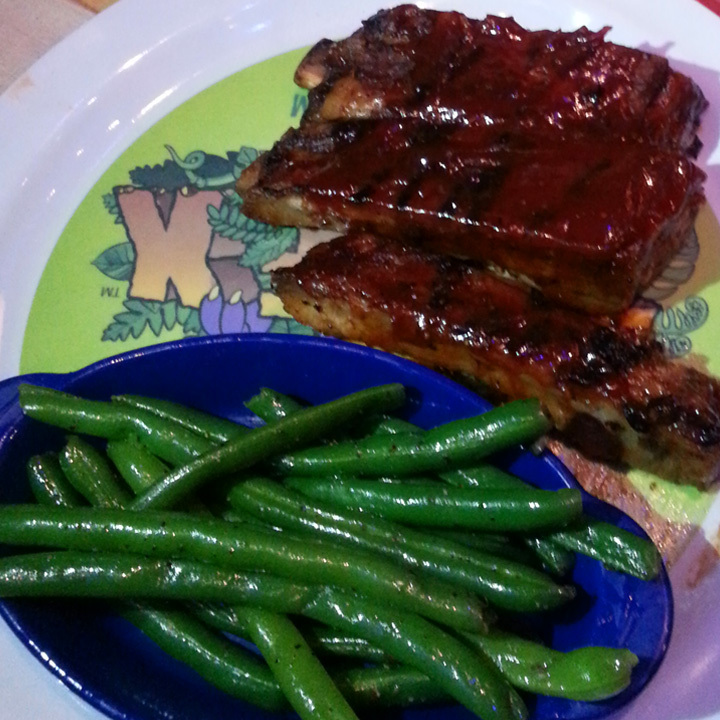 Disney World restaurants impress us with on how they cater to food allergies. The manager came over to discuss our daughter’s interests and food allergies as though as it’s a natural thing and happens all the time. That’s what I really like about their customer service. You feel like you belong. Yak & Yeti is a Pan-Asian restaurant. Their cuisine is a nice departure from the typical quick service offerings at Disney parks (fries, hamburgers, hotdogs, etc.). In retrospect, we should have ordered the pan seared pork potstickers for Kay so that her food is similar to ours. 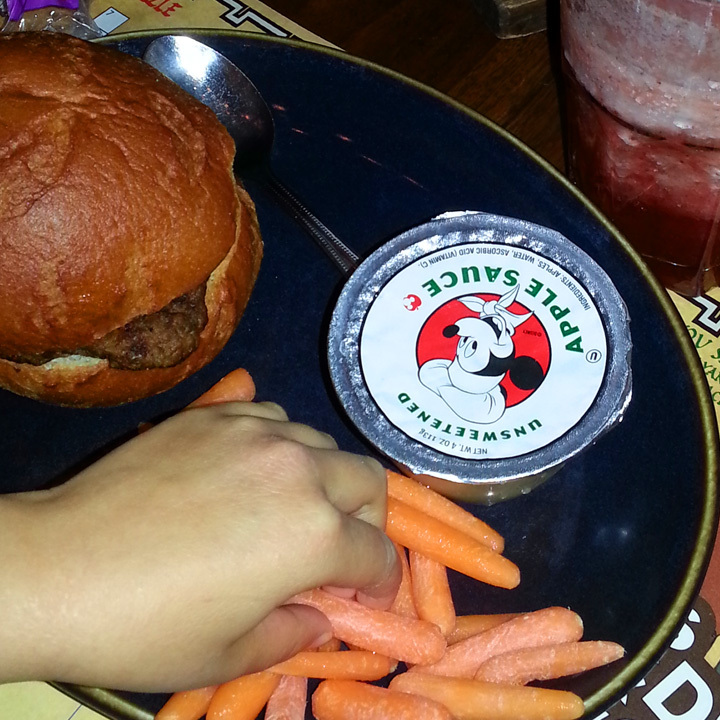 But when we found out their hamburgers from the Kids’ Entrées are dairy-free, buns included, we couldn’t resist ordering one for her. At most of the other restaurants, her hamburger orders are bun-less since bread is typically outsourced and the ingredients are unknown. So this was a nice change. The Mini Burger we ordered came with a good serving of baby carrots and apple sauce (rice and brown rice are also side options). She liked her burger but not as much as the dessert. 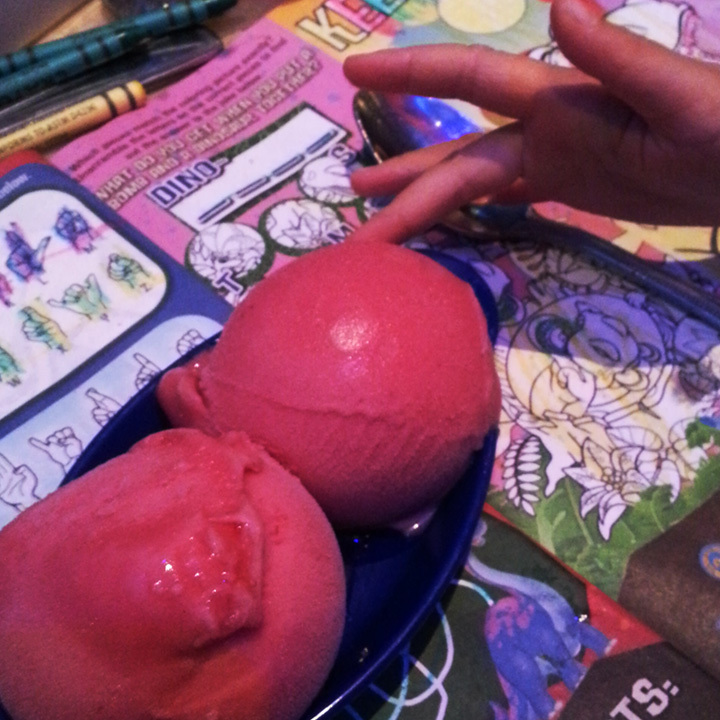 There was no dairy-free dessert for kids so she selected the Sorbet from the adult menu. 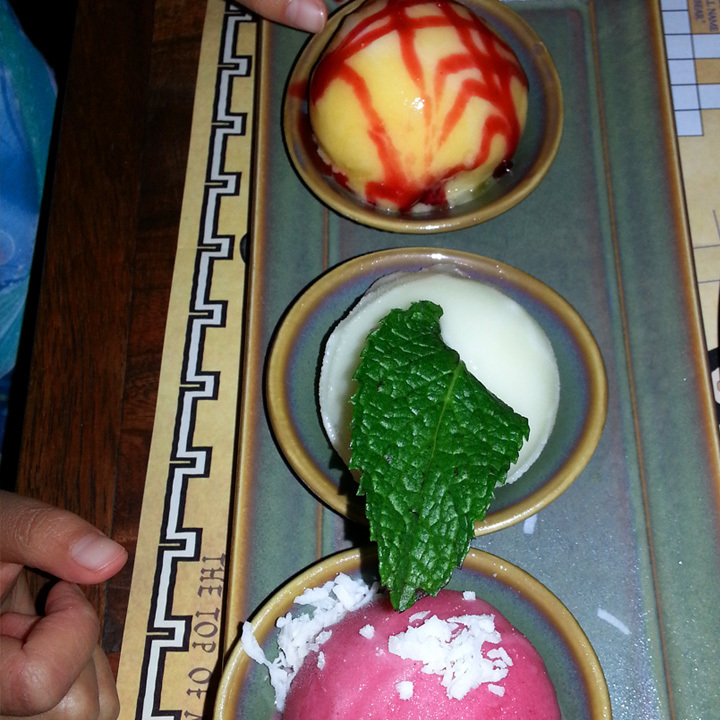 It’s a trio of mango, lemon and raspberry sorbets, nicely plated with large portions. Needless to say, she wasn’t able to finish it (and we wouldn’t have let her anyways). When we stayed at Disney World, we were on a dining plan and actually enjoyed all of our table service meals. These next posts will be ALL about Disney dining. 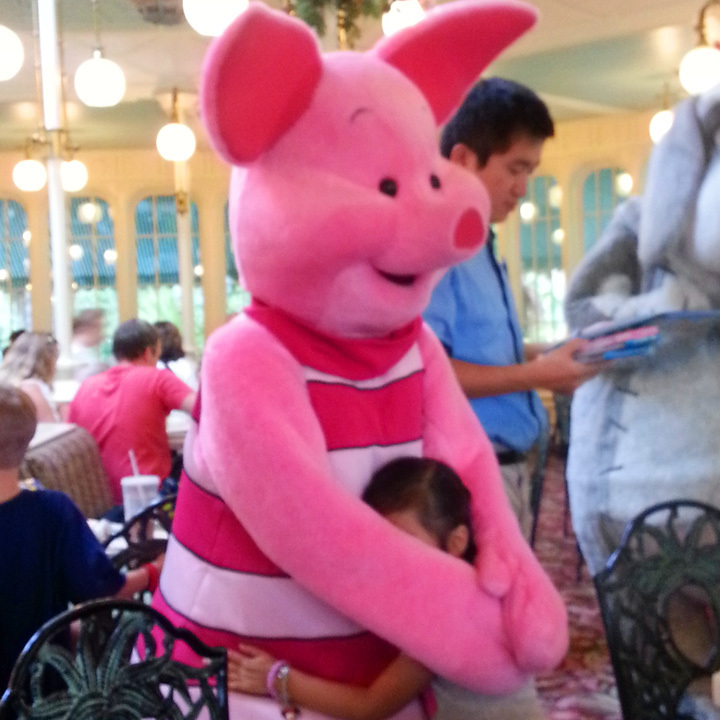 We had the character breakfast at Crystal Palace. We didn’t go there for the food. We were there to see Winnie the Pooh and friends and to take advantage of the early reservations. This gave us access to Magic Kingdom before the park opened for great photo opportunities! The food was mostly standard breakfast buffet fare. What stood out in my mind were the Mickey waffles and breakfast lasagne (warm trifle cake with fruit and Bavarian cream). Those are must-haves! For our daughter, we mentioned her allergies to our server and was informed that the manager would come and walk us through what’s safe for her to eat. Service overall was good except for that wait. I think it took 20 minutes before he showed up. By then we’ve already laid out some dry cereal (Fruit Loops) for her to munch on. 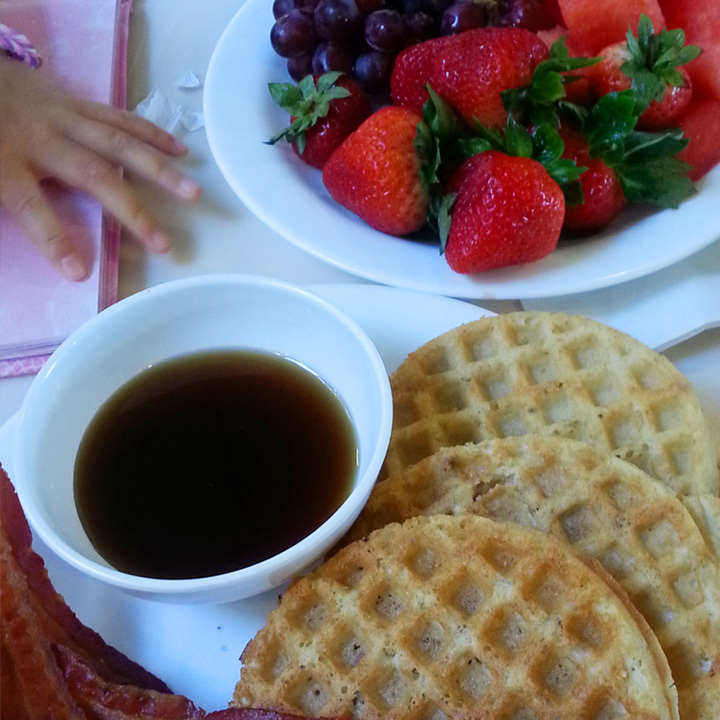 Once we’ve discussed her food allergies and what she’s interested in eating, we settled on a bowl of fruit, Van’s Waffles and bacon (her favourite). It’s too bad Mickey waffles aren’t dairy-free. I would’ve like for her to try them. The overall experience was good. Kay’s face lit up like never before with each of the characters. It was only then I truly understood the power and effect of Disney. It really is a magical place once I saw it through her eyes.